Now that my family and I are moving into our own home, we are without the basic appliance necessities, such as a fridge and a washer and dryer. If you have been in the market for either two of these recently, you know that they do not come cheap. It may also be worthwhile to protect your purchases. While our purchases were still pricey, we were able to shave hundreds of dollars off each appliance by doing these simple tips. 1. Wait for a Sale and Stack Coupons: For our refrigerator, we waited for a 10% off sale through Lowes. This happens quite often, and it can be stacked with another 10% off Lowes coupon (which can be received if you are moving from the Post Office). Also, you can use competitor’s coupons too, but be informed that using competitor’s coupons varies by store managers. Appliance sales seem to happen during just about any major holiday. 2. Buy Discounted Gift Cards: If you know which store you will purchase your appliance and the price range of it, then you can start buying discounted gift cards to use towards the purchase. Websites like PlasticJungle.com usually have Lowes and Home Depot gift cards for 10% less than the retail value. So if the gift card has $100 on it, you would only pay $90. PlasticJungle.com gets their gift cards through people selling their unwanted gift cards to the site. Therefore, there may not always be home improvement store gift cards in stock. Another site to check out is Ebay. The amount you pay for a gift card is varied and dependent on the seller and how many people you are bidding against. I have saved as much as 20% on a gift card just because I was the only one interested in a gift card over $300. If you plan on spending over $1000 on appliances, why not buy as many discounted gift cards as you can. If you bought three $300 gift cards for $285 each, that would be an overall savings of $45 on your appliance. That may not seem like a lot, but every bit counts. 3. Shop Online: On top of using discounts, shop through cash back sites. Popular sites include ShopatHome.com and Ebates.com. UPromise.com also has a cash back program and has a set rate of 5% cash back for majority of online stores, including Sears, Home Depot, and Lowes. 4. Buy the Store Model: Another way to save a quick $200-400 on an appliance is to buy the floor model. Of course, the savings and price vary from each store since it is per store manager’s discretion. 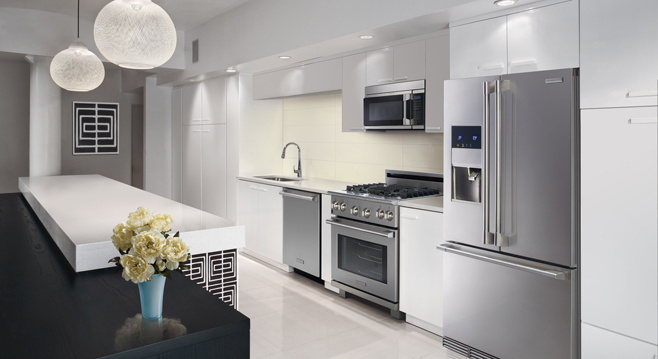 You may get lucky and score a great deal on a nice appliance. However, many of the store models have cosmetic damage, which can be easily fixed. Also, be aware that you will most likely not be able to use a coupon on top of this discount. Home appliances may be costly necessities, but there are still small ways to save money on purchasing them. Try these easy steps to save a few hundred dollars on your next purchase.